Instead of spending eight months making a birth plan, I should’ve spent eight months reading books on how to take care of a newborn. Birth plans rarely work out, but babies are sure to come. When people tell you that you need to “Ferberize” your baby and let him cry it out in his crib… well, if it goes against your grain, as it did mine, and makes you rip your hair out, then pick your baby up and hold him. I sang my son to sleep every night. On co-sleeping: If your toddler wants to sleep with you and it’s all right with you and your husband, I say go for it. If he or she still wants to sleep with you at age 16, then you have a problem, but children are precious, and I don’t think you can nurture too much. If your friends don’t like babies, you probably need to find some new friends. Pronto. If you are feeling overwhelmed or sad or generally freaked out, it’s because there’s a new human being in your life, and you are totally responsible for him, for his every need. You should be freaked out. (I asked my doctor for more Percocet. He said, “No. That’s not going to help.”) Don’t be embarrassed to find a counselor if you need one. Find a mommy-and-me group. Nine years later, two of these moms are two of my dearest friends. Purchase, read, and reread The Happiest Baby on the Block by Harvey Karp, M.D. This became our baby bible. The 5 S System works! My husband and I would flip through this thing at 3 a.m. trying to figure out which ‘S’ we hadn’t tried yet: Swaddling? Swinging? Sucking? Shushing? Side position? Don’t be a competitive parent. If your child isn’t talking, walking, or eating solid food at the exact same time as his peers, it’s okay. All babies are different. You can never love your child too much. Maternal and paternal instincts exist for a reason. Go with your gut. Don’t sweat what your parents or in-laws or friends think. This is your child. You know what you’re doing, and if you don’t, get one of Harvey Karp’s books. From the author of The Handbook for Lightning Strike Survivors, which Library Journal called, “ripe for Oprah or fans of Elizabeth Berg or Anne Tyler,” comes a magical novel about a family of women separated by oceans, generations, and war, but connected by something much greater—the gift of wings.On March 29, 1973, Prudence Eleanor Vilkas was born with a pair of wings molded to her back. Considered a birth defect, her wings were surgically removed, leaving only the ghost of them behind. At fifteen years old, confused and unmoored, Prudence meets her long-estranged Lithuanian grandfather and discovers a miraculous lineage beating and pulsing with past Lithuanian bird-women, storytellers with wings dragging the dirt, survivors perched on radio towers, lovers lit up like fireworks, and heroes disguised as everyday men and women. It is a story of mutual understanding between the old and young; it is a love story; a story of survival, and most importantly a story about where we belong in the world. This “is a raw, beautiful, unforgettable book” (Lydia Netzer, bestselling author of Shine, Shine, Shine). 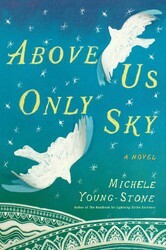 Michele Young-Stone is the author of the novels Above Us Only Sky and The Handbook for Lightning Strike Survivors, which The Boston Globe called “an exceptionally rich and sure-handed debut.” She lives in the Outer Banks of North Carolina with her husband and son.